I did not get a chance to make a post at that time but eventually Danwei wrote about it recently on January 14. One week ago, I saw this interesting post on KDS with the title “Pretty girls on Israeli streets”. 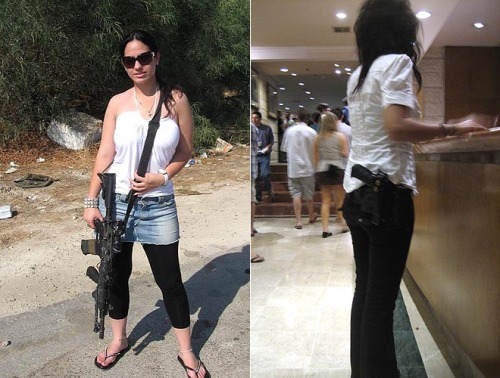 In the topic were many posted photographs of Jewish girls carrying big guns while walking around on Israel streets. 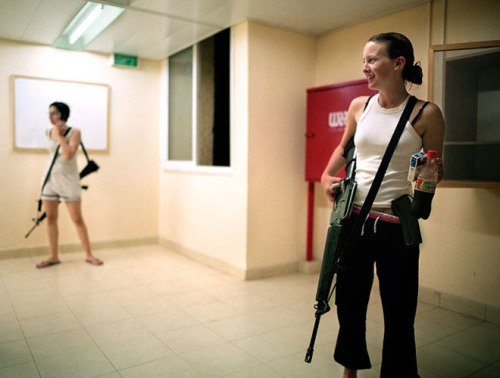 On KDS, the photos first began with girls carrying guns on the Israel streets. Later in the topic, the original poster posted Jewish girls he thought were good looking. Some appear to be in the military but some are uncertain. …look too many times and you will be shot to death. Universal military service [?] Their women even have tank units. They key is character, character. If our country was like this, then everyday there would be fighting on the streets. Hitting on these girls involves the risk of getting shot in the head! Israel’s women’s appearances are not bad. I would rather live in a society where police do not need to carry guns. The day you discover even traffic police carrying guns to work will be the day to start crying. God’s chosen people – having a gun on on your self all day. Do you now feel the benefit of the government controlling firearms? The pretty ones I bet are wild animals in bed. It is very difficult to imagine what would happen to them after being captured by the enemy. [Their] uniforms are very pretty. Why are our army’s uniforms always so old-fashioned??? Playing an Israeli girl will result in a very horrible death. I would prefer that everyone can carry guns. At least there would no longer be Xinjiang thieves. Whether they have stability or not for outsiders to say. At least their passports allow them to go to other countries. If Shanghai was surrounded by Hamas, I would also want a gun to protect myself. I really envy having such a nice gun. If I had that, it would be so nice. Whoever bullies me, I will take the gun and go kill his entire family. Right, peace is not easy to come by. So we need to cherish it. I also hope the world can have fewer wars. It is not easy for people to be able to live. Hope they can all have peace. Interesting, bringing a gun to the bank to deposit money…hehe…Israel definitely does not have any thieves. No need to chase, shot at long-range. Definitely no perverts/lechers. No need to be afraid, shot at close-range. Do not marry these girls! If they get worried, they will drag you outside and shoot you! Israel is truly impressive, in that kind of environment creating that many miracles! Israel seems to be a universal mandatory military service country. In China, this would be inconceivable!!! Perhaps shot dead on the spot!! Next article Beijing Railway Station Employee Ticket Scalping? Pingback:(NWS) Girls and Guns (contains provocative pictures) - Page 899 - XDTalk Forums - Your HS2000/SA-XD Information Source!